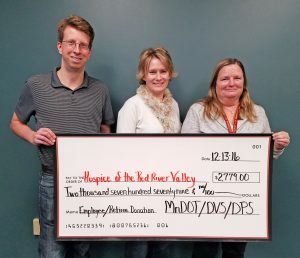 Employees and retirees of the Minnesota Department of Transportation, Minnesota State Patrol and Driver & Vehicle Services in Detroit Lakes held their 22nd annual employee holiday potluck and fundraiser for Hospice of the Red River Valley on Dec. 13, 2016. This year’s event raised $2,779 for Hospice. Every December, these agencies transform their lunchroom into a workshop of handcrafted and home-cooked items. Proceeds from the potluck have raised a total of $29,624 for Hospice of the Red River Valley since the event’s inception in 1995. Jane Butzer, Trudy Kordosky and Jerimiah Moerke organized this year’s event. Current and former employees donated a variety of items for the potluck and drawing, many of them handmade, including quilts, crocheted items, wood products, jewelry, stained glass, sweet treats and other goodies.